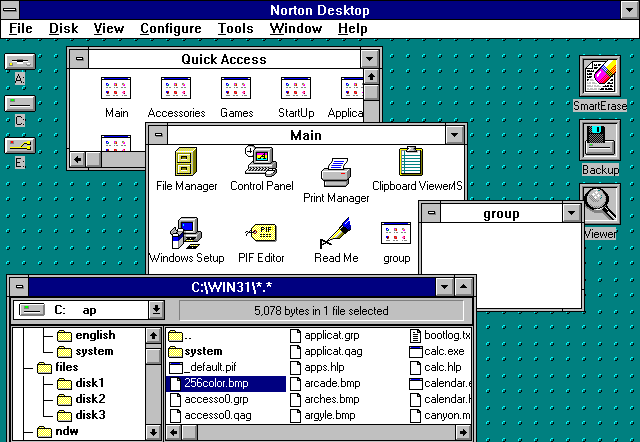 The Norton Desktop is a desktop shell replacement for Microsoft Windows 3.x that is heavily integrated with a number of disk utilities from Symantec. 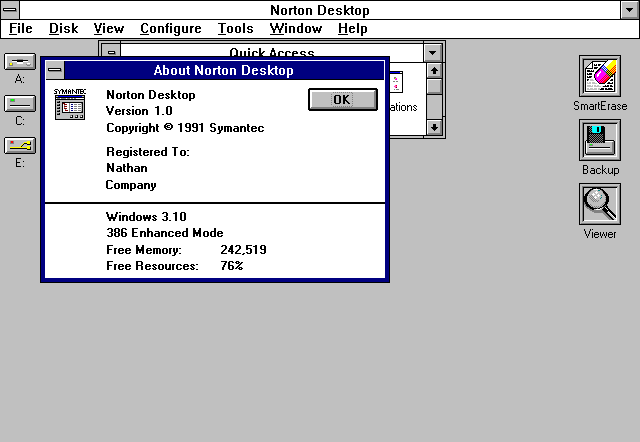 It's actually amazing that at one point there was a market for alternate desktops for Windows. When Windows 95 came out its shell incorperated many of the enhancements other alternate shells offered, and eventually Microsoft even started forbidding OEM pre-installs from defaulting to alternate shells. 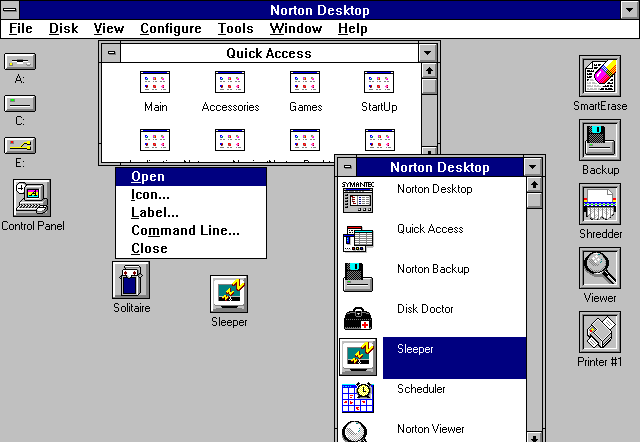 The Norton Desktop appears to be an attempt to make Windows look more like the Macintosh. The desktop consists of a menu bar with many file management options, there are disk drive icons on the left and utility icons on the right. The positions may be reversed so the drive icons are on the right. 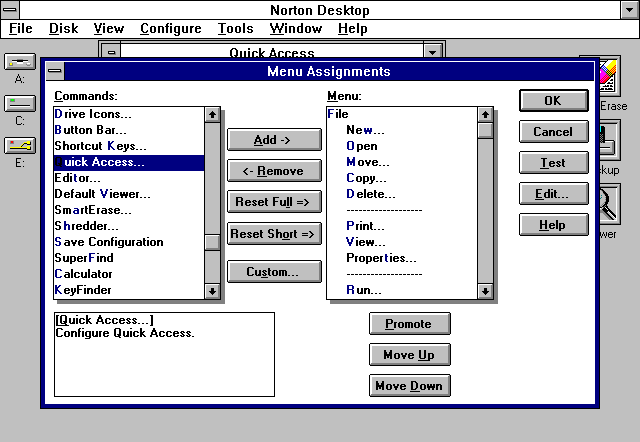 On installation, the Norton Desktop imports all of the Program Manager program groups in to its Quick Access group. Oddly there is no desktop icon to activate this window. It is instead accessed by clicking the "Window" menu option and selecting "Quick Access". (Not so quick?) These groups may be nested inside other groups. these groups can be viewed as icons or as a list (show below). Double-clicking the drive icons opens up the desktop file manager. It is a fairly straight forward file manger displaying an expanded tree view on the left and the contents of the folder on the right. All file options are accessed through the desktops menu. In this screen shot I set a Windows background to show that the Desktop application is not actually covering the windows desktop, letting anything behind it show through. This part seems a little buggy. Program items can be dragged to the desktop, but they don't seem to want to stay there. They behave more like minimized programs, even though the application is not running. Clicking on the icon brings up the menu shown above, but I had to select any option twice before it actually did something. Program groups dragged to the desktop would behave exactly like minimized windows and disappear from the desktop when the window was closed. This may have changed in later versions. 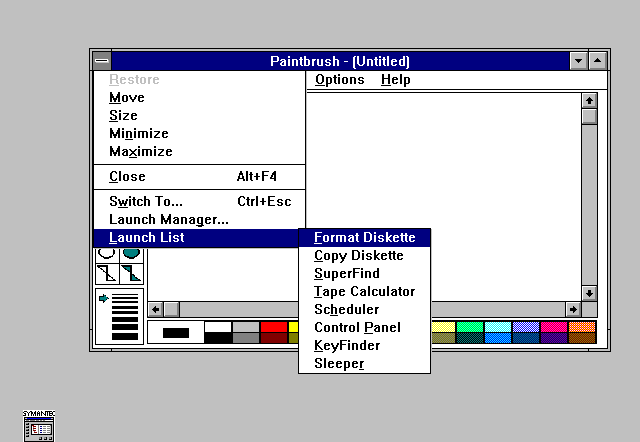 This screen also shows additional utility icons. Files or items can be dragged and dropped on these icons to open the specific utility. The menus are completely customizable. There is also an option for "full menus" and "short menus"
These are some of the utilities that ship with Norton Desktop for Windows. 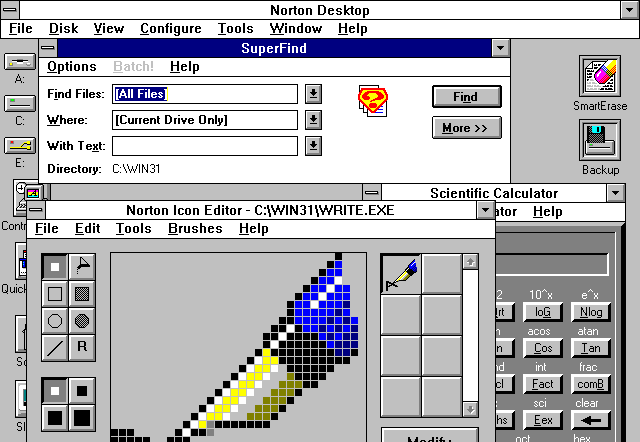 There is a scientific calculator, a file finder, and an icon editor. Norton Desktop for Windows 1.0 also ships with its own screen saver system. 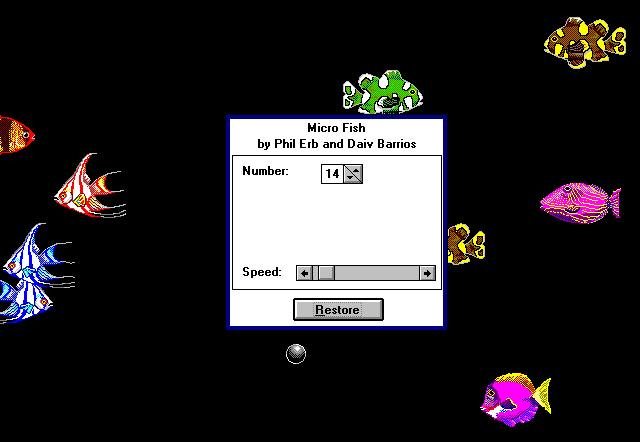 I think this version was designed to run on Windows 3.0, which did not include built-in support for screen savers. Even though the desktop is normally in the background of other applications, it can still be minimized as shown in this screen shot. Finally, the Desktop also adds its own menu of utilities in to the standard window control box of any application.